This past weekend was the much-awaited opening of a 26km section of the Old Ghost Rd track out in Lyell. We've been hearing and reading little bits and pieces for a while now about this new classic trail being constructed, so when they advertised that they were having a special opening day with heli-drops to the top of the trail, we were all fired up to go and see what Mokihinui-Lyell Backcountry Trust crew have been up to the last two years. Heli biking is still and will always remain quite the novelty to me, especially when you have to contact DOC to make your booking through them. That is so freaking cool. We quickly got a big Nelson crew together to venture over the mountains for a day of riding in some new unexplored territory. At the Lyell campground, the vibe was buzzing, literally, with three helicopters shuttling all the wide eyed, chattering mountain bikers (and hikers) to what seemed like the top of the world. Watching the guys load the bikes to the helicopter, you knew we were out on the West Coast, where you just figure stuff out and make a plan. "No problem. Sweet as. They’re good as gold mate", was the reply we got when asked if they’ve ever loaded bikes this way before. It looked like a giant Christmas tree decoration, with 22 bikes dangling down from the helicopter. We were dropped off on the top of Mount Montgomery, 1300m above the Lyell trailhead which sits at 150m, with 26 km of virgin purpose built singletrack to descend. We were literally dropped off on the trail after a pretty long heli flight into the backcountry. 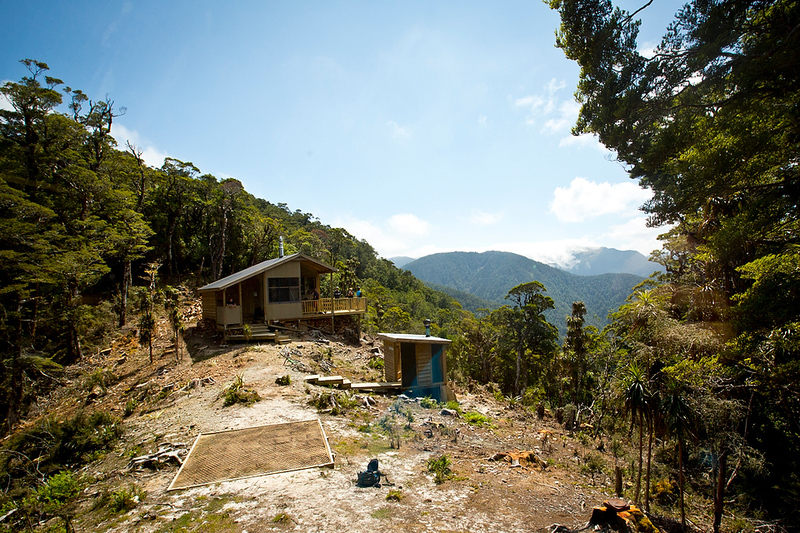 It was gorgeous up there; the views of the surrounding forests, the flowering rata and the mountains were spectacular. We took our time to soak up all this beauty, enjoying the morning with freshly brewed coffee and snacks before setting off and sharing this new trail with some of the trail builders, who were like giddy kids the night before Christmas, excited to show off their work of art. The amount of work that they have put into this project is unbelievable, and we enjoyed every kilometer of it. From open tussock mountaintops to beech & Dracophyllym clad native forests. We were really blown away once we reached the new huts that they built. What a spot. Two smaller private cabins and then the mother ship of overnight huts – they were even kitted out with double bed bunks. I can’t think of a better spot to ride in to and spend an evening with some mates and beers of course, and the prospect of flowing singletrack to the bottom of the valley in the morning. Although mostly machine built and still pretty fresh in places, the trail follows the natural contours and has a fun flowy feel to it with natural rollers and rises. 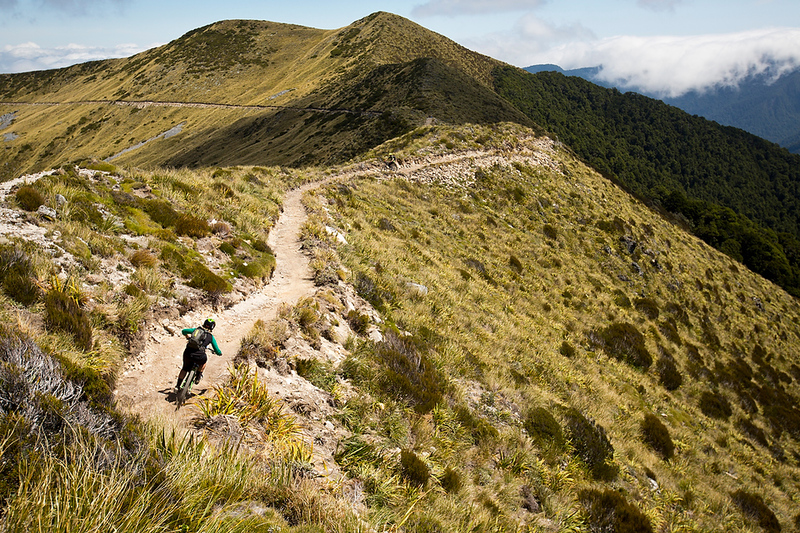 Its width makes it accessible to all as a grade three trail but expert thrill seekers will not be disappointed either. We can’t wait for the final few sections to be connected, joining the Upper Buller Gorge to the mighty Mokihinui river mouth 80km away. 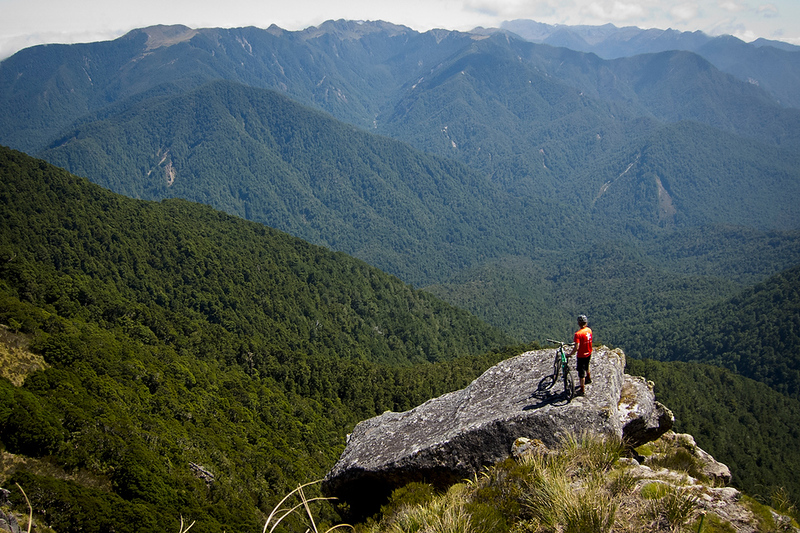 This will fast become one of New Zealand’s flagship epic rides rivaling the nearby Heaphy and open all year round to mountain bikers.